While brown eyeliner is always a match for brown eyes, deep blue tones can look especially amazing. Want to highlight the lighter accents in brown eyes? Light or reddish-brown eyeliner can bring out new dimensions in brown eyes. Try black eyeliner if you want to add more drama for an evening look. You can also change things up with gray, silver or purple eyeliner tones. Blue eyes can benefit from darker shades to brighten and bring them out even more as well as promote contrast. From dark blue to dark gray eyeliner, blue irises will shine and look more dazzling. Metallic eyeliner tones can add mystery and intrigue to blue eyes, and warmer shades like copper or medium browns can also provide an attractive counterpoint. Lighter shades of brown eyes look beautiful when lined with green or amber toned eyeliner. Blending these colors with a bit of dark brown can create a more subdued effect, while a charcoal eyeliner color can create a more striking look. 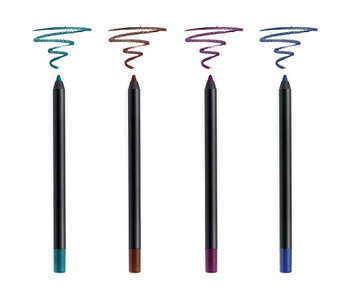 Change things up with a plum or muted gold eyeliner pencil. Red hues are wildly complementary to green eyes; choosing eyeliner colors with red notes can really make green eyes look striking. Eyeliner in rust and reddish-brown tones can set green eyes ablaze, but take care not to overdo it; too much red can make eyes look irritated or tired. Whether you desire a classic look for an evening out or something a little more flashy, we are prepared to create to create the perfect look and help you feel your best. Call today!